Nonprofit website designs are a big undertaking, especially given your limited budget and small, busy team. That’s a big reason most nonprofits tell us they’ll manage their content entry, meaning they’ll transfer their page content, blog posts, media and other files themselves. Sounds easy, right? When we hear that we can’t help but feel worried—this usually doesn’t end well for their team. In fact, it often causes the project to be delayed and to go over budget. For this reason (and several others we’ll discuss more below) when we guide nonprofits through their website design project, we always encourage them to have us or another professional handle content entry. Let us explain. Copy and pasting all your website page content over takes a ton of time. Now imagine copy and pasting all of your blog posts and their imagery over. There are automated tools to help with this that several agencies will offer. They will also help ensure there are no broken links within posts and that everything is running smoothly—perhaps even more smoothly than your old blog. 2. Design: You’ve already paid for good, clean design. Don’t mess it up. If you chose the right web design agency, it’s likely you have nice and clean page layouts. You paid a lot to have someone design and develop the pages so that your users can find the content they want easily. When you enter your content without fully understanding this design, it’s much more possible your design will get messy. An agency or professional will know how to enter and edit content and images so that the formatting is correct and is optimal for user experience. 3. SEO: Words are not enough. You need strategy. You have a beautiful new website for the world to see, but you don’t have a way to show up in search results. To get people to find your pride and joy, you need SEO. This doesn’t just mean copy and pasting your content. It means optimization of words, URLs, images and the like. A good agency will be able to include this as part of their content entry process. And they’ll do so quickly. 4. Project Management: Save time. We recently had a nonprofit client that opted to do their own content entry and they ended up launching the site a month late. We couldn’t blame them—they have so many other priorities to juggle. However, this caused a lot more back and forth and we had to re-open their project, costing them more. Besides the financial burden, this lost them that month’s worth of potential traffic. 5. Future Plan: Get started off right. Besides all the time and money you save, having the professionals handle your content also saves you time down the road. They can show you the most efficient way to enter your content and provide a model for how you should format it. Similar to helping your design stay clean, having an agency set you up with a website style guide or template for your pages and blog posts will help all your future posts or additional pages look consistent and function optimally. We hope this helps you in determining what to do with your website content. 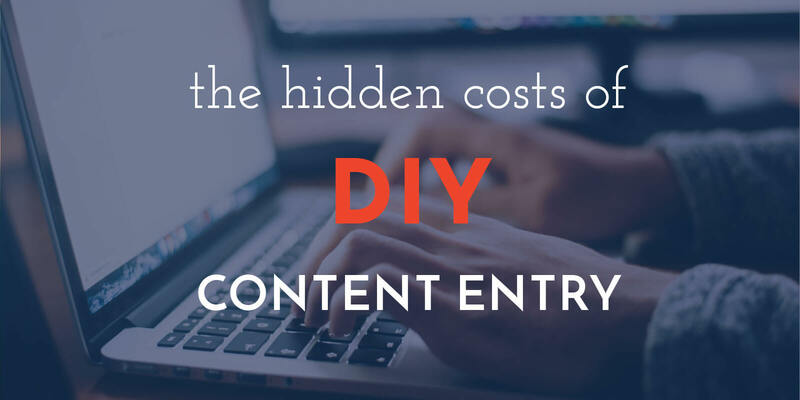 We know it gets complicated when you have to cut corners here and there in order to stay under budget, but we encourage you to see the hidden costs of DIY-ing content entry. ⟵A simple guide to content marketing for nonprofits.